Our range of products include circular electro magnet. We manufacture electromagnetic Circular Electro Magnet type lifting magnet for a hot and cold application. Normally it will manufacture aluminum or copper based on the application. 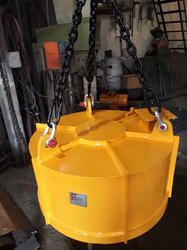 Magnets are available from 600 mm dia to 2200 mm dia for lifting various type of ferrous material. We will also offer the battery back up system in case of power failure for safety purpose.